– Covington Grid Method for Polaris circle reticles. 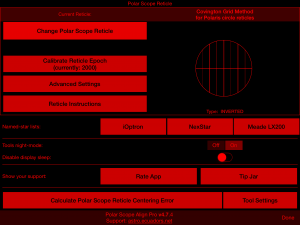 More info on Polar Scope Align on the dedicated page. 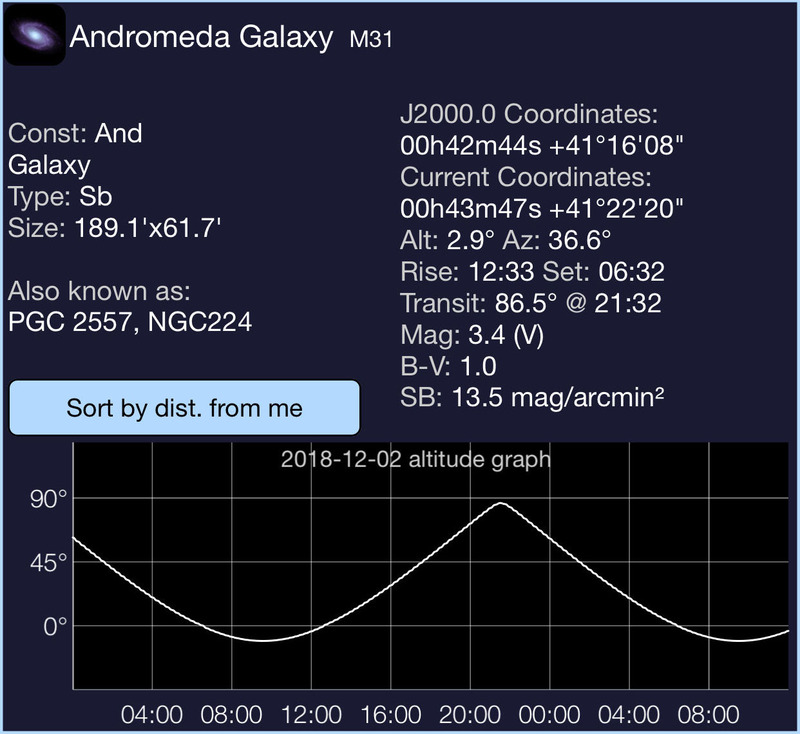 -Added daily altitude graph for objects in the DSO database. -Vixen Atlux 1983-2012 polar scope added. -Konus 2000-2020 polar scope added. -Takahashi 1985 – 2015 updated to look more realistic, minor adjustment to the Classic Celestron/Skywatcher crosshair. 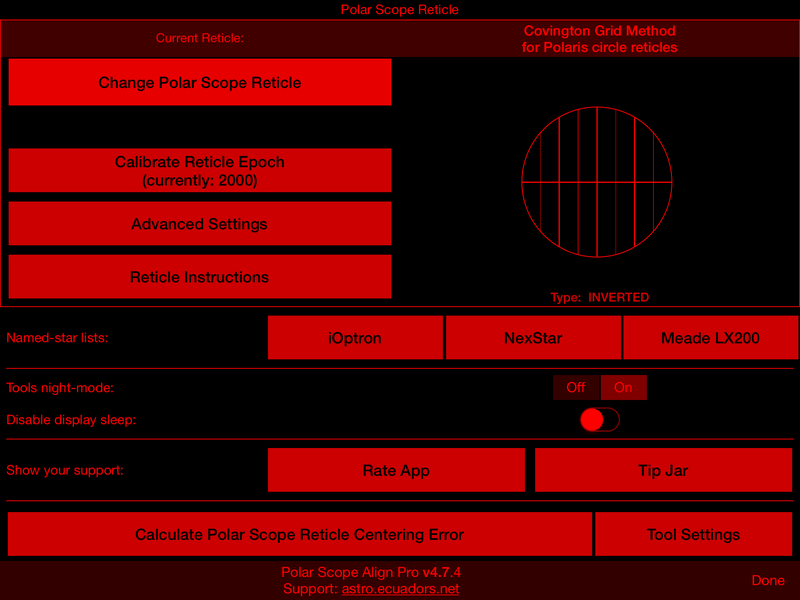 -New polar scope reticle selection screen to accommodate the long list of reticles (22). Landscape mode for Pro versions. -Replaced in-app system alerts with custom dark alerts. -Faster loading DSO DB, meridian transit time and altitude added in object details. -Support for iPhone XR/XS Max. -Polaris info screen with refracted vs true position, meridian crossings / Kochab’s Clock times etc. 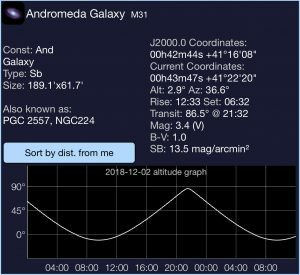 -Advanced option to use Gaia Polaris coordinates. -iPhone X full screen support. -Updated instructions (mainly for Astro-Physics RAPAS). – Added Explore Scientific 8×50 RACI PolarFinder. – Fix LST calculated for longitude 0 for some users when using auto location. Apologies, this was missed in the 4.0 release. – Moon Phase view added to the first screen, moon/sun rise/set times on second screen. 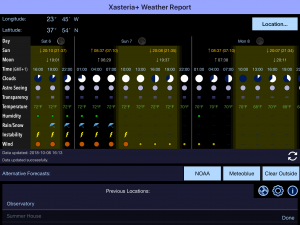 – New (third) screen with the Xasteria weather report. – Ability to switch mode (Polar Alignment, Bubble Level, Day Alignment, Moon Phase) from the watch. – Day/night mode switch on the watch. – Better refresh rate for Bubble level and Day alignment. -Celestron 7×50 Polaris Finder added. -Moon Phase: Current moon altitude in degrees is shown. -Calculators: General relativity time dilation and Celsius/Fahrenheit added, default values on all calculators. Long hold on the result of a calculator gives you the option to copy the value. -DSO Database: “Sort by distance from me” on search item applies to full list. Return to top button added. Improved the “Point to the sky” function in the Sorting menu with a continuous refresh when you hold the “Select Point” button. -Several visual tweaks, most notably a new icon and help fixes/additions. – Polar scope reticle centering wizard now has a manual setting tool for mounts whose polar scope does not rotate with the RA axis. – Fixed behavior of “sort by distance to me” button in DSO DB. – Help improvements and quick intro screens when first launching the app and on first visit to the settings. – Some reticles get a margin when used in the Southern Hemisphere, to allow things like offset display. – Added rise/set times of objects in DSODB. – Fixed superimposed Select/Cancel buttons. – Fixed disappearing copy popup in help. -Switched to WebKit for faster rendering of help & web pages and copy/paste ability on iOS 11. -Corrected application of stellar aberration – should fix lower culmination discrepancy compared to USNO. -Added nutation calculation, brings it to about 2-3 seconds accuracy compared to Cartes du Ciel’s apparent coordinate calculations. -Julian Date calculator now converts from JD to calendar date and increased to 5 digit (sub-second) precision. -Atmospheric refraction toggle in advanced settings. -DSO setting to show apparent coordinates of objects. Bottom buttons reversed to match other tools. -The “Point To The Sky” sort function in DSO Database now shows icons with the type of objects when showing a list of the nearest objects to where you are pointing. -When your device does not give the app access to the true north heading, you will be warned and the app will try to calculate true north from the magnetic north. -DSO DB list view has clearer font. -Fixed slider/switch issue on iOS 6. -Point your phone to the sky and sort the DSO database list by distance from where you pointed. -Fixed Julian Date calculator month input issue. -A couple of adjustments to the exposure calculator (based on my own eclipse testing). -When the app upgrades to a new version (not new installations), it will anonymously share the iOS version, reticle and tools used, so that I can focus development appropriately. I intend to keep support for iOS 6/7 devices for as long as I am allowed, even for very few users – but if no users appear to be on an old iOS version, it may be dropped sooner. -Solar Eclipse presets for the exposure calculator (mostly based on Fred Espenak’s exposure tables). -Updated to new iOS SDK (better iPad Pro compatibility). Tell me if there are any issues! 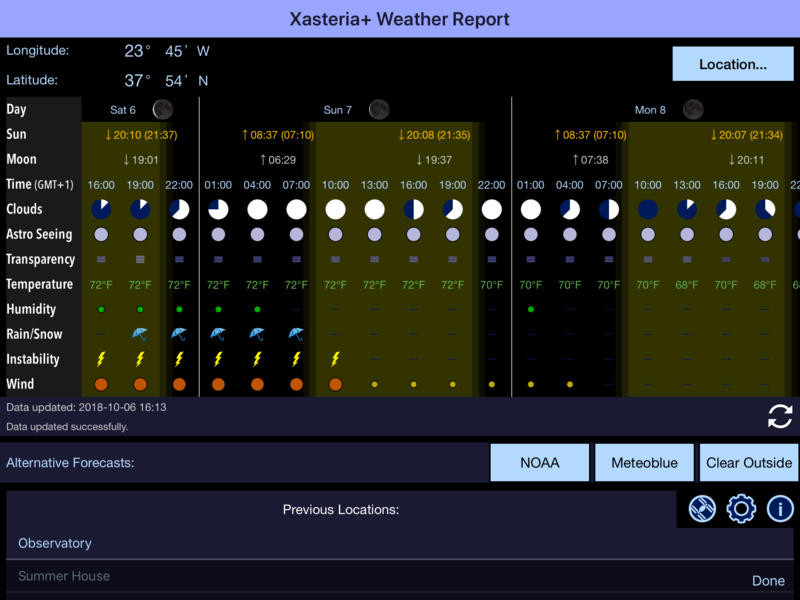 – New calculators: Solar feature size, Light gathering (Pro) and DSLR exposure calculator. Also, some calculator fields have a button to select from a list of values (e.g. sensor size, reducer focal length). – Improved look for some tools, increased design consistency. – Set Zero Position button restored for Skywatcher/Orion 2012-2032 reticle. -Added Old Celestron CG4/CG5 / Vixen Polaris reticle. 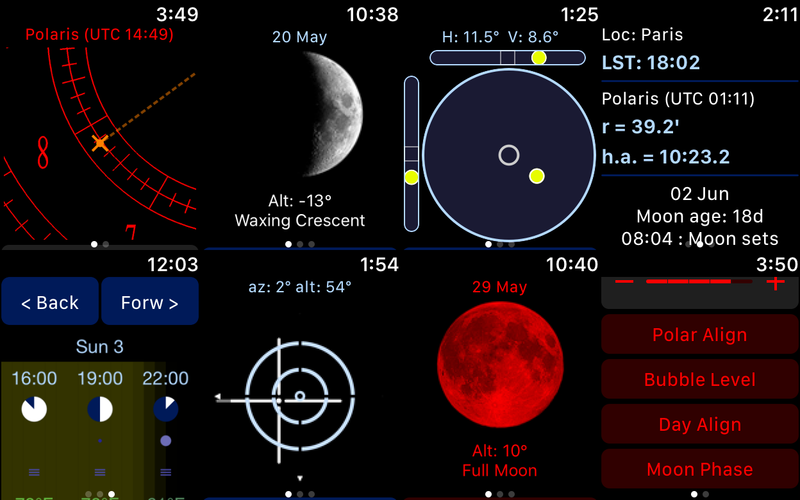 -Calculators added (one for free version and more for Pro version including lunar feature size, special relativity time-dilation). -Takahashi 2010-2050 reticle adjusted to not confuse owners of the latest EM-11 version. -Fixed keyboard not getting dismissed in Set Epoch screen. -Added South Hemisphere versions for two Skywatcher reticles and improved reticle instructions. -Sharpless 2 catalog added to the DSO DB, as well as 329 named stars and a few more named nebulae, taking the total to over 13000 objects for the Pro version, bright stars added to the non-Pro version. -Added ability to sort by distance from an alt/az coordinate point in DSO DB. -Deep Space Object Database with over 12000 objects from several catalogs (Messier, Caldwell, NGC, IC, Herschell 400). The database is searchable and fully configurable with filters, various sorting methods etc. The non-pro version has a smaller database of the Messier and Caldwell objects. -Reorganized settings screen (reticles were getting to be too many to fit the page!). -Added Kenko Skymemo RS reticle. -Added σ Oct version of the Astrotrac. -Vixen Polarie display shows arcmin instead of years for Polaris location. -Various tweaks in app layout and help. -Vixen GP/GP-DX polar scope added. -Separated the very old style Synta (Celestron / Skywatcher etc) reticle from the more common “classic” (and actually current for Celestron, but replaced by most others), in order to match better those two reticles respectively. Reticles list re-arranged a bit. -The “classic” Celestron/Skywatcher etc reticle can be calibrated (using dift alignment or ASPA) so that its epoch matches yours exactly. -Advanced settings screen improved, “Always show dashed cross” option added (it helps with some reticles to have a horizontal/vertical line for reference). -Switched time/date entry fields to local time by default (UTC is now shown below LST) in order to avoid confusion about the date shown. You can still switch to UTC entry in advanced settings. -General help added (icon on top of main page). -Corrected Synta 2012-2032 reticle name. Celestron hasn’t switched to it so far, only Orion / Skywatcher. -Moon phase corrected for South Hemisphere. -Show atmospheric refraction correction (for Astrotrac). -Advanced settings page (with tip jar). -Setting the reticle zero point on “new” style Synta (Skywatcher / Orion) mounts that come with the reticle installed in a random orientation. -“Classic” Celestron / Skywatcher / Orion as well as Losmandy polar scopes get an option to set the “zero position” RA for mounts like modern Celestron GOTOs which you do not have a resettable setting circle. You should only need to find the zero position once. -Constellations on “Classic” Celestron / Skywatcher / Orion drawn to match reticles (instead of matching the sky). -Updated Tuthill to better match the actual reticle. -Updated Takahashi EM200/400 to aid those that have the 2000-2030 version. -Adjusted location list display (font size & placement) for iOS 9 devices. -Meade 9×60 Polar Viewfinder added. -Updated Tuthill Polar Axis Finder. -Polar Scope Align Watch Edition renamed to Polar Scope Align Pro Watch (Apple request). -Distance listings in miles when switched to Imperial units. -Updated help for several reticles. -Added Astrotrac / Losmandy / Kenko reticle support. -Classic Skywatcher / Celestron… adjusted circle to better match actual reticles. -Vixen precision alignment method for Southern Hemisphere and alternate reticle. -Fixed v2.0 scaling issue on Tak 2015 and Tak 2030 reticles. -Added Takahashi EM200 / EM400 reticle. -Added Classic Skywatcher / Celestron / Meade / Orion reticle. -Added Vixen Polar Axis Scope reticle. -Fixed Sigma Oct display for South Hemishpere. -Added Orion 2012-2032 reticle for the latest Orion mounts. -iOS 9 font fix. Get it if you are on iOS9! -Higher accuracy movement in the Reticle Centering Error screens. -Offset calculation for Takahashi EM-200/EM-400 users. -New Watch Edition released for those who have an Apple Watch. -Added bubble level and North heading (Pro). -Cleaned-up design, especially settings page. -Fixed iOS 6 launch issue (non-Pro). -For reticles with year-cycle markings, the year cycle notation for the polar star position is listed on the lower right of the reticle. -Fix PM bug when 24-hour time is disabled for some locales. -“Force GPS” option (try it if you don’t seem to get a location update at rural areas with no cell signal). -Expanded dimmer to all screens (pro version). -Fixed installing Free instead of Pro version for some devices (sorry). « 3D-printable iPhone X dovetail holder!